In the aftermath of the terrorist attacks on the United States on 11 September 2001, the prime ministers of Australia, Canada, and the United Kingdom began the task of framing these events for their respective audiences through their many public addresses and speeches. Given their different geographic locations, political cultures, and experiences with terrorism, the ways in which these attacks were framed differed. Each of these prime ministers was concerned with managing local circumstances in the face of global challenges to security. As the most public representatives for their respective countries, the prime ministers’ efforts to present events in particular ways is critically important in terms of how the local and global public interprets events. We examine the period immediately following 9/11 and consider how communicating these acts may have been impacted by general and specific terrorist security threats against these countries; their respective political histories with the United States; and the resources available to each prime minister (and his country) to address these concerns. Finally, we consider the legislation that has since been put in place by these three countries to deal with terrorism. 1 The terrorist attacks of 11 September 2001 brought security issues into global focus in a striking and formidable way. As Sebastian Barnutz observes, that date marked a turning point in the ways in which security and threat were defined.1 Robert Ivie and Oscar Giner noted that there has been a "ritualized story of danger" that has defined the United States since 11 September.2 The interpretation of these attacks differs substantially depending upon the perspectives of observers relative to the incident. For example, individuals are more or less impacted given their particular social, personal, and geographic circumstances. Individuals perceive events differently in their lives depending upon life circumstances; risks are defined and addressed differently depending upon how factors impact their lives. For example, one might expect that those who are wealthy define risks differently from those who struggle economically. Similarly, states also inhabit particular circumstances and are more or less threatened by global events depending upon their respective situations both domestically and on the world stage. 2 This article considers how the prime ministers of Canada, Britain, and Australia responded to the threat posed by the terrorist attacks on the United States on 11 September 2001. The prime ministers were the literal faces of security in the aftermath, and each commented on the terrorist threat and the positions each country took. However, Canada, Britain, and Australia maintained appreciably different positions because of their geographic relationship to the United States. Beyond physical proximity, each country also occupies a different position based on its relationship with the United States; with each other and the world community; and with its own respective citizens. Canada’s interdependence with and proximity to the US is unique among the three countries considered here. The historical ease of passage between the United States and Canada and the magnitude of the trade relationship are significant factors impacting their relationship. Moreover, Canada is the foremost trading partner of the US. While both Britain and Australia have trade relations with the US, their connections are based less on economic factors than on ideological and political issues. Additionally, Canada, Britain, and Australia are members of the Commonwealth of Nations. "The purpose of the Commonwealth is consultation and cooperation"3 and member nations generally have economic, trade, and development ties. But membership in the Commonwealth does not imply any control over its members, each is independent. 3 The initial official reaction from all three countries to the terrorist attacks was unequivocally that the terrorist attacks were considered an unacceptable act of aggression against the entire civilized world, not just against the United States. What soon became evident were the different ways that each framed the on-going threat of terrorism, especially as the focus of attention turned from Afghanistan to Iraq, and what should be done about it. Furthermore, the communications from each prime minister used the attack as a vehicle through which other only tangentially-related messages could be transmitted. As Mitchell Dean notes: "risks have a certain polyvalence, i.e. they can be invested with different sets of purposes depending on the political programmes and rationalities they come to be latched onto. "4 Canada’s official messaging focused heavily on the trade element, while Britain used the attack to frame its unique position in world affairs as a bridge between the US and Europe. Australia, on the other hand, tagged the issues of immigration and border security to its discourse. 4 Our discussion begins with a consideration of the notion of risk positions and how this applies to each of these states. Social, economic, and political factors provide the contexts from which countries identify and respond to terrorist threats. We briefly describe the foreign-policy agendas associated with each of the three countries, noting that foreign policies may be seen as a resource associated with more or less capital, and capital of varying kinds. We then consider the content of the communications emanating from each prime minister’s office, including speeches, statements, and press releases issued during the period September 2001 to December 2003. Legislation emerging from each country is then examined, along with local and global events during the period September 2001 to December 2009. Finally, we discuss the ways in which risk positions have or have not evolved since 9/11 and its implications for collaborative and singular efforts to secure against terrorist threats. 5 Just prior to the turn of the twenty-first century, many social theorists suggested that we were entering a new era: the risk society. For Ulrich Beck, in particular, this meant that the former basis upon which social groupings were made — primarily access to resources — were replaced by the democratizing effect associated with the threats faced in today’s world.5 Rather than class position or access to goods determining one’s social position, Beck theorized that vulnerability to threat, or exposure to "bads," would become the basis upon which classifications would be made. Vulnerability would replace wealth as the glue holding particular groups together and others apart. It is clearly not the case that wealth has become irrelevant in today’s society, since those with greater wealth are able to buy protection in the face of adversity. At the same time, vulnerability to particular types of threats facilitates a form of cohesion or collective agreement among various parties that may have been unlikely in the absence of those threats. 6 With respect to risk positions among states, this means there are differences that will not be eliminated in the face of threats such as terrorism. It is problematic to suggest that less wealthy countries are able to protect themselves with the same effectiveness as more wealthy countries. For example, poor countries in Africa cannot protect themselves against terrorism in the same way that wealthy European states might. Moreover, the threat of terrorism is not equal among countries. For example, compared to more wealthy countries, poorer countries make less attractive targets and therefore might be less likely to be targeted by terrorist groups. Terrorist groups are more likely to be attracted to a country with economic prosperity. In the context of terrorism, that which is a strength is often perceived as a source of vulnerability. The idea that states are not equally vulnerable to terrorist threats is part of an ongoing discussion within the United States. In the US, less populated states have made the claim that they are entitled to as much federal protection from terrorism as the more populated states. This claim is made in the face of information that terrorist strikes are far more likely to occur in areas characterized by significant infrastructure capacity, something that is not characteristic of smaller and less populated states. This illustrates that countries, not unlike particular regions or states within countries such as the US, vary in terms of their risk positions. Each state has certain characteristics that combine in various ways with exposure to particular threats, resulting in specific and unequal vulnerabilities. 7 In addition to target attractiveness, risk positions are assessed in light of the stage at which a threat can occur. For some countries, threat of terrorism remains abstract, while for others, like Britain and the United States, the threat has been actualized. This will play into the ways in which threats are framed and addressed. These distinctions among states in terms of their risk positions pose challenges for collaborative efforts to deal with terrorist and other threats when the urgency of these threats varies substantially. As Erin Gibbs Van Brunschot and Leslie Kennedy note, risk position may be determined by assessing vulnerabilities in the face of various threats, balanced with an assessment of resources.6 While it is true that a levelling occurs when facing similar threats, the significance attributed to vulnerability and the consequences associated with it varies substantially. 8 In particular, vulnerability and the consequences of vulnerability to specific threats must be placed in the context of the resources available to address named threats. A more recent example highlighting the complications of risk positions is that of Somalia. In Somalia, where war has prevailed for many years and where al-Qaeda is presumed to be influential, the threat posed by terrorism is clearly less when considering the fact that Somalia is facing its worst drought in sixty years. With limited resources available to apply to terrorist threats, the risk associated with that particular type of vulnerability must be evaluated in light of resources available to address vulnerabilities. Resources may be social (including resources based on various group memberships or, in the case of states, particular political alliances), cultural (including characteristics that relate to determinations of status), and economic (money, trade, and physical reserves). When dealing with states, the realms of social and cultural capital include foreign policies. Foreign policy provides context to the risk positions that each of Britain, Canada, and Australia maintains and is briefly described next. Sjoberg suggests that this confusion comes from an inability to take into account the different players in this new conflict using conventional approaches to international relations, particularly assuming that this is simply a "levels of analysis" problem rather than one that considers the interactions between agents and context, as we have alluded to in our discussion of risk positions. So, it is with this mandate in mind that we address the ways in which the major actors in different countries assessed their risk positions relative to their own vulnerabilities and defined their own priorities in terms of security. 12 In a report published in 1995, the Canadian government described its foreign policy as working toward three objectives: "The promotion of prosperity and employment; the protection of our security, within a stable global framework; and the projection of Canadian values and culture. "12 The pursuit of these objectives would be facilitated by multilateralism, cooperation, and interdependencies. A second aspect that figures prominently in the report is the Canada-US relationship. In his 2004 report on national security and the government of Prime Minister Jean Chrétien, Joel Sokolsky describes the Canadian government’s approach as one of "realism" regarding Canada’s national interests.13 Sokolsky describes the Canadian government as operating on a "how much is just enough?" approach. Canada, according to Sokolsky, has attempted to carefully weigh the benefits that accrue given a particular contribution to world affairs. Aligning with and contributing to the United States’ effort has not necessarily been matched by a compatible degree of influence. It has not been the case that the more support one gives to the US, the more influence one has. Instead, Sokolsky notes, "it is clear that Washington intends to be the architect and leader of any coalition; and that, above all, allied contributions will not result in any influence. "14 Canada’s position has tended to be that contributing more to US initiatives is no more likely to be effective than contributing less. 13 Like many other Canadian governments, rather than focus on military security, the Chrétien government focus on economic security was central to foreign policy. Trade missions, often referred to as "Team Canada," are the method of choice over troops and planes as the means of ensuring security. For the US, "(military) security ‘trumps’ economics," yet for Canada, Sokolsky explains that security is not distinguished from economics.15 The US expectation that Canada would put more dollars behind its military contradicts the realist orientation of the Canadian government and contrasts with the long-standing recognition by Canada that such spending has done little to influence American policy. The Canadian emphasis in the United Nations Security Council has ensured at least some recognition by the US of the concept of multilateralism – a concept that Canada has favoured as a means of ensuring "economic security." 14 Tom Keating explains that multilateralism invokes a set of normative and "positive values juxtaposing the more favourable image of multilateralism with what is widely portrayed as the less constructive option of unilateralism or, in Canada's specific circumstances, of a bilateral foreign policy attached to dominant and domineering powers. "16 Political interests have at the same time been served by multilateralism, as it has "been used to deflect, corral or temper the imperial pressure of close allies — Great Britain in the past, the United States at present. "17 Further, Keating notes that multilateralism has "implications for the authority and legitimacy of decisions taken, along with the efficacy of such decisions. "18 While Canadian public support for multilateralism has been strong, support for multilateralism in the international arena has been more equivocal, with a willingness to be "at the table" tending to be based more on particular issues at hand than underlying support for a multilateral approach. 16 John Eatwell describes British foreign policy over the last fifty years as consisting of three central ingredients. First, Eatwell notes the efforts by the United States in the post-Second World War era, where the US effectively tried to undermine the British Empire. Prior to the war, Britain was the most formidable imperial power, but after the war Britain’s power declined substantially. The 1956 Suez crisis, when the US failed to support Britain’s position against Egypt, demonstrates the turning tides of power in global affairs. Despite this lack of support from the US, Eatwell notes a second ingredient to British foreign policy: the early recognition that to retain any degree of power and influence in world affairs was to remain close to the emerging power — the United States. Eatwell notes, "in Prime Minister Harold MacMillan's phrase, Britain was to play Greece to America's Rome, to be the wise diplomatic and philosophic advisor to the brash, new fledgling authority. "20 The third ingredient was the cultivation of the "special relationship" that Britain had with the US, and the nurturing of the United States’ then-emphasis on multilateralism in the post-war period, and its relationship with Europe in particular. Below, we see evidence of this description in the speeches and statements emanating from the British prime minister’s office. 18 Australian foreign policy has been described as fluctuating between two doctrines: "the great and powerful friends doctrine" and "Asian engagement." Prior to the Second World War, Australia’s major partner in trade and defense was Britain. Having been left on its own to defend itself against Japan during the war, post-1945, Australia’s close relationship with Britain was traded for a relationship with the United States. In 1952, Australia, New Zealand, and the United States signed the ANZUS Security Treaty, which marked the beginning of a new era in the relationship between the United States and Australia.23 For a period during the 1980s and 1990s, Australia’s foreign policy focused on the Asian connection, with both Australian Prime Ministers Bob Hawke and Paul Keating courting Australia’s Asian neighbors with respect to trade and security arrangements. The government of Prime Minister John Howard, in power during the events of 9/11, on the other hand, focused much more predominantly on Australia’s relationship with the United States. 20 David McGraw elaborates on Australia’s foreign policy as being "realist" in terms of three specific characteristics. First, there has been an increasing willingness to expand and use military power to achieve foreign-policy goals. Second, Australia has emphasized the importance of maintaining relationships with specific allies — namely, the United States. Finally, during Howard’s reign as prime minister (1996-2007), there was growing scepticism regarding the efficacy of international institutions.27 In particular, the United Nations was increasingly viewed with disregard throughout Howard’s reign, so much so that in 2000 Australia initiated an inquiry into the UN demonstrating its rejection of a report criticizing the treatment of Australian aboriginals. 21 Having positioned the three countries in terms of their stated foreign policy, our task is now to examine how the events of 9/11 and the sudden emergence of the threat of global terror impacted the ways in which those most influential in articulating the risk positions of these respective countries defined their reaction to these threats and their views on security. 23 Our analysis began with an overview of each communication item. They were included in the analysis if any direct mention was made of the following key terms and phrases: "terrorism," "terrorist," "terror," and "September 11." Items were also included if they made reference (either directly or indirectly) to "(international) security." For the Canadian prime minister, there were 365 press releases and speeches issued during this period, 140 (38%) of which were included in this analysis. For the British prime minister, there were 87 statements and speeches during this period, 55 (63%) of which are included in this article. Finally, for the Australian prime minister, there were 270 communications, of which 194 (72%) were relevant for this analysis. 24 For our study, we undertake a variant of "ethnographic content analysis (ECA)" or, more simply, "qualitative document analysis," to reveal the themes that were prominent during this time frame.29 David Altheide explains that this method treats documents as symbolic representations, with the aim of analysis being to explain how it is that events are placed in context, with the goal of identifying "themes, frames and discourse." Here we "track discourse" and consider how various themes emerge over this initial time frame. 25 In their analysis of counter-terrorism campaigns, Arjun Chowdhury and Ronald Krebs note the importance of political discourse and the ways in which public speaking serves to frame topics in specific ways. They suggest that "political language constitutes the terrain of contestation, privileging particular courses of action and impeding others. The key concept is legitimation: the articulation before key audiences of publicly acceptable reasons justifying concrete actions and policy positions. "30 As the leaders of their respective countries, prime ministers play a key role in framing threats, their significance, and what will be done to address them. Prime ministers must attempt to manoeuvre in ways that appreciate their relative risk positions, evaluating their unique context. As Chowdhury and Krebs observe, political leaders must also take into consideration dominant discourses (which they have contributed to), as well as understandings of the specific threat at hand. 26 We now turn to our analysis and the themes that emerge from our review of the prime ministers’ communications. Similar themes are discussed for each country. For Canada, our examination of the documents revealed four broad themes: threat; perpetrators; context; and Canada, the United States, and the Canada/US relationship. For Britain and Australia, we note three themes: threats, perpetrators, and context. Our consideration of these communications was not meant to generate mutually exclusive categories, and we did not attempt to classify speeches as primarily having to do with one or another theme. Rather, the goal was to uncover themes running throughout the materials. In our analyses, we discuss these emergent themes and how they relate to, and may be illustrative of, risk positions. 27 Not unlike the other prime ministers, Jean Chrétien’s initial response to the events of 11 September was to describe the event as a global threat toward civilized society that must be addressed collectively. Although the danger posed to values of peace and security remains over the entire period examined, the risk that is described begins to change to a threat against the local and global economies and the trade relationship that Canada has with the United States. 28 Immediately following 11 September, Prime Minister Chrétien described it as "an offence against the freedom and rights of all civilized nations. "31 The prime minister instantly asserted that, "this was not just an attack on the United States . . . The world has been attacked [and] [t]he world must respond. "32 Repeated references to threats to "free and civilized nations" and "civilized values" suggest that uncivilized "evil" has arrived, compromising the civilized values of society and the values of peace, security, and freedom. 29 A year later, the prime minister refers not only to threats to values ("openness and freedom"), but also to the dangers posed to an "open world economy" (the importance of the trade relationship itself was noted early on). Specifically, 11 September posed "a threat to the largest trading relationship in the world" and threatened to "accelerate the global economic slowdown that had been apparent even before 9/11. "33 In his response, the prime minister refers to the ability of the "Canadian economy to withstand the shock of 9/11 with extraordinary resilience" and with its "partnership with the United States . . . [to] ensure that [the] economy will not be held hostage to the threat of terror." The Smart Border Accord, implemented in December 2001, was created so that the Canada-US border would remain "open for business, but closed to security threats," again drawing attention to the importance of the economy. As time passed from the events of 11 September, the emphasis on economic issues grew increasingly prevalent. 32 When the war in Iraq became increasingly likely, Chrétien referred to Saddam Hussein as "crazy," a "common danger" to the world community, and a "threat to peace in his region." Except in conjunction with terrorist attacks abroad, the number of references to terrorists decline, shifting the focus from the perpetration of terrorist acts to the role that Canada itself would play and the position that Canada would take with regard to troops representing Canada abroad; and Canada’s role in reconstruction efforts (considered further in the following section). 33 In a speech on 15 October 2001, the prime minister states, "the scope of the threat that terror poses to our way of life has no parallel . . . on September 11, 2001, the world changed. A global struggle began. The first great struggle of the 21st century." Further, the point is made that it is the first great twenty-first-century struggle for justice: "a struggle for freedom and justice." The term "struggle" suggests that there is a possibility of "winning" or "losing" the "fight against terrorism." Yet as the term struggle diminishes, the phrase "new security environment" becomes increasingly prevalent. In the latter part of 2002, the prime minister notes that "a fundamental obligation of government is ensuring the security of our citizens." Then, in February 2003, the prime minister states, "We are faced with the harsh truth that our personal human security is intimately linked to the security of strangers living continents away. We have learned that great powers are not safe from danger. Wealth cannot buy safety. Military might is no guarantee of security." Late in 2002 and during the first months of 2003, the US was at the point of going to war against Iraq — without the support of Canada or the United Nations. 34 The idea that there is a "Canadian identity" was evident throughout the press releases and speeches, tending to centre on the view that there is a distinct set of Canadian values. The communications emphasize "values that are profoundly held by all Canadians: tolerance, democracy, internationalism, peace building, respect for human rights and the rule of the law. "39 The prime minister also refers to being guided by key principles, including "mutual respect and accommodation; civility and peaceful resolution of conflict; and intercultural dialogue." Later in July 2002, the value of mutual responsibility among countries emerges: "We share a belief in freedom; in justice and fairness; and in solidarity and mutual responsibility." 37 A number of themes emerge in the speeches, statements, and press releases issued from the office of Prime Minister Tony Blair during the period September 2001 to December 2003. These include subjects such as: "our way of life;" "justice and humanitarianism;" "master statesman;" allies and friends; and global relations — Iraq, the Middle East, and Africa. Blair, not unlike Chrétien, emphasizes the "wickedness" of those responsible for the attacks in the temporally proximate stages following the attacks. Early on, Blair flags some of the issues that he will pursue as part of his agenda with regard to responding to terrorism, such as his emphasis on achieving peace in the Middle East, along with the early mention of drugs and the role that Afghanistan and the Taliban have played in the drug problem in Britain. Compared to Chrétien, Blair spent much time in his speeches emphasizing and justifying the role that he was playing with respect to the US. While we clearly see at least some degree of "standoffishness" regarding Chrétien’s position to the US, the vigour with which Blair is seen to partner with the US results in significant and numerous attempts at justifying that position — both internally and externally, especially with regard to Britain’s European neighbours. In the discussion that follows, the "evolution" of the framework that Blair employs over the course of the time period examined will be discussed. 41 The above quote also hints at a significant theme that was common to all three prime ministers: the threat to the "way of life" of their "civilized" societies. Part of the focus on "way of life" appears premised on the "rightness" of that way of life: Blair, Chrétien, and Howard imply that what has been disturbed by these events are their countries’ right to a life of their choosing — a life that is "right" or acceptable according to their standards. Essentially, Blair’s position is that the terrorist attack on 11 September was an attack on all who hold democratic, liberal beliefs. As part of the civilized world against which this attack was perpetrated, a duty is owed by those who were attacked to defend these beliefs and this way of life. 45 While collaboration is central to "serving justice" for Blair, there are other motivations behind collaboration that may be less directly connected to the issue of terrorism. Throughout the early portion of the period under examination, Blair emphasized that the collective response to Afghanistan must be both military and humanitarian. "It is justice, too, that makes our coalition as important on the humanitarian side as on the military. "56 This theme continues during the invasion of Iraq and reflects the British position on accountability: wrongs must be made right and the "innocent," those who are caught in the crossfire, must be offered assistance. In his statement to the House of Commons on 13 November 2001, Blair states: "And finally I would simply say to the people of Afghanistan today, that this time we will not walk away from you. We have given commitments. We will honour those commitments, both on the humanitarian side and in terms of rebuilding Afghanistan. We are with you for the long term." The initial response to 11 September was indeed characterized by an apparent international and collective will to oust the Taliban from power in Afghanistan. However, as the situation in Iraq developed over the course of 2002, there was considerably less agreement, both within Britain and abroad, about "siding" with the United States and what many perceived as the unilateral approach being taken by the US. 49 In this same speech, Blair insists that Britain should remain the closest ally of the US and "influence them to continue broadening their agenda." This notion that Britain has some influence over the course of action that the US will take is emphasized in a speech delivered to the US Congress later that year (July 2003). Here, Blair indicates that the United States can "bequeath to this anxious world the light of liberty. "60 The prime minister also describes Britain’s "understanding" of the position that "the average American" might consider himself to be in. While this particular example cites self-confidence as a potential problem, the statement ends on a note that clearly suggests Britain knows it brings to the table particular qualities that make it a leading power — particularly its relationship with the United States. 53 Blair faced a great deal of domestic opposition to the position taken regarding Iraq. It is in their approaches to Iraq that we see significant differences among the three prime ministers and their respective communications. Howard, for example, clearly supported the invasion of Iraq and faced substantial opposition at home. Blair, on the other hand, personally agreed with the invasion of Iraq and offered his country’s support, despite the clear divisions at home over this issue. On the other side of the table, Chrétien faced comparatively little criticism (except from the opposition party), when he decided against Canada’s support for the invasion of Iraq. 55 Having made the decision to support the invasion of Iraq, Blair again makes reference to a lack of understanding among those in opposition that the central issue linking terrorism and weapons of mass destruction is the common threat both have to "our way of life." I have been in detailed consultation with the UN Secretary General Kofi Annan, the UN High Commissioner for Refugees Ruud Lubbers and other leaders . . . over the past three weeks the Foreign Secretary and I have been in intensive contact with foreign leaders from every part of the world. In addition, the Foreign Secretary has visited the Middle East and Iran. I have visited Berlin, Paris and Washington for consultations with Chancellor Schroeder, President Chirac and President Bush respectively. Later today I will travel to Moscow to meet with President Putin. 60 While the other prime ministers also refer to the need for collaboration, neither Chrétien nor Howard details the extent to which each has personally contacted other world leaders. 62 In late 2001, Prime Minister John Howard of Australia was facing an election. The election campaign provided numerous occasions for the prime minister to reflect on the events of 11 September. The number of speaking engagements by Howard during the fall of 2001 substantially exceeds either Prime Ministers Blair’s or Chrétien’s. 63 As with his North American and European counterparts, many of Howard’s speeches reflected a similar emphasis on the terrorist attacks as being a threat to "our way of life" and a direct attack on democratic society the world over. Early in the period, Howard links the issues of immigration, asylum seeking, and border security — all perennial issues for Australia — with terrorism. 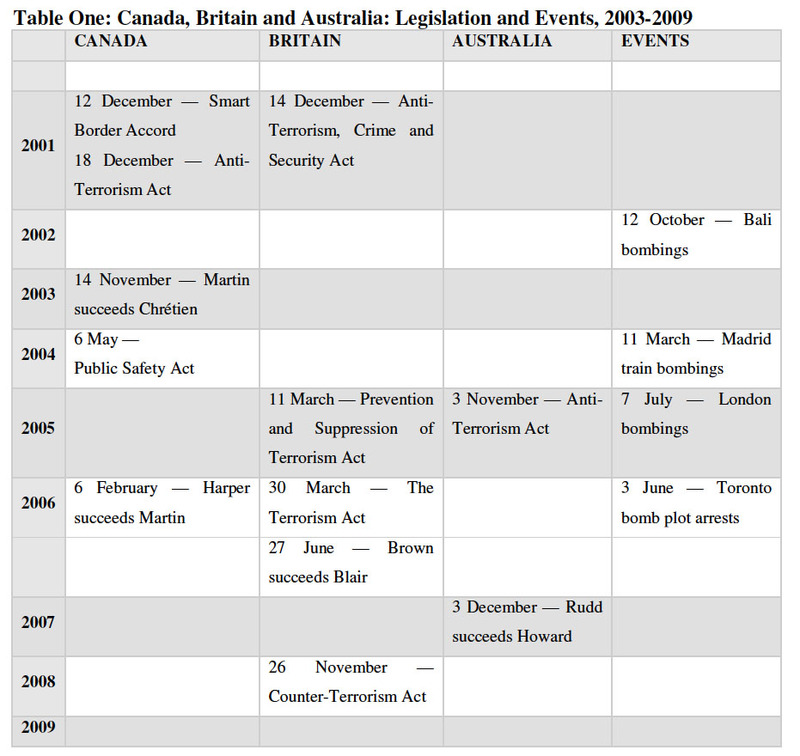 Compared with both Canada and Britain during this initial time frame (2001-2003), Australia was unique in that it was the only one of the three countries to have been targeted by terrorist attacks. Although the attack in Bali in October 2002 was not on Australian soil, the terrorist attack specifically targeted the Australian embassy and a night club whose clientele was substantially young Australians. The readiness to stand by one’s mates is also prevalent in how the Australian prime minister describes the motivation behind his support of US President Bush and the relationship between their respective countries. 66 Not unlike his prime ministerial peers, Chrétien and Blair, on a number of occasions Howard remarked that those who would commit acts of terrorism are not "like us." At the same time, Howard makes reference to who Australians are — and it appears that they are not like anyone else, either. There are many references throughout the communications to a rather keen sense of the hardship that Australians have historically borne and the challenges that have faced them over the years — as well as references to overcoming adversity. 67 At the turn of the twenty-first century, Australia was again facing the perennial question of immigration and how decisions regarding who might be allowed into the country were being made — a frequent criticism of the Howard government. One particular location that was cause for much concern is Ashmore Reef, located off the northwest coast of Australia. Many would-be immigrants to Australia are left at Ashmore Reef to eventually find their way to the Australian coast. While needing rescue, often those who do land on Australian shores are considered as having entered Australia illegally and are considered criminal. Access and border security were seen as significant issues with respect to terrorism, as it was initially believed that the terrorists who participated in 9/11 had made their way to the United States through Canada (later proven to be mistaken). The issue of illegal immigration is raised repeatedly with regard to border security and the right of a country to determine who was allowed in and who was not. 69 We note references to Australia’s history as symbolic of the understanding that Australians have of immigration and their embrace of immigrants. Howard further notes that the criticisms that Australia has faced are unfair, as Australia has acted as it has due to legal issues and not to discrimination. 70 The emphasis on the threat that immigrants pose is associated with what Howard and others have defined as a new form of threat often tied to border security — yet the challenges of immigration are longstanding. As is the challenge of good and evil, border security appears as a reasonable placeholder for issues that may be longer standing than the new threat of terrorism that has emerged. This quote suggests that while the threat may be somewhat new, the response of Australia and other countries must be to address the threat directly — confront and defeat it. 72 At the same time that borders are seemingly defined as more worthy of careful watch in terms of who is let in to Australia, concern was also expressed about the whereabouts of Australian youth and their ability to freely travel. The mobility of Australian youth came to the forefront after the Bali bombings in October 2002 which had targeted a nightclub frequented by young Australian travellers (88 of the 204 who died were from Australia). The permeability of (other) borders is of central importance to Australians whose global location is somewhat remote. The Commonwealth binds all three countries, as noted earlier, and while each country may act as a separate entity, membership in the Commonwealth implies similarity of position on many issues, politics notwithstanding. In November 2002, President Bush went to the United Nations General Assembly and asked the Security Council to endorse taking action against Iraq that would reveal WMDs. While unanimously passed by the Security Council, Howard buttressed his decision to support the Iraq invasion on a number of occasions since this decision was not consistently supported by the Australian public. Howard draws on the fact that the events of 11 September took all by surprise, and that Australians could understand the new urgency with which issues such as WMDs were being investigated. Further, Iraq had used their weapons before. 76 The speeches, statements, and press releases reviewed above suggest that each prime minister dealt with the events of 11 September in diverse, as well as similar ways — the polyvalent threat of terrorism is framed according to the risk positions that each country inhabits. As suggested above, a number of factors contribute to how risk is assessed, and therefore the meanings attributed to that which is identified as threatening differ. Canada, for example, shares a major trade relationship with the US and is physically proximate to the US, which has resulted in an extensive history, making it seem reasonable that maintenance of Canada’s relationship with the US would be prioritized. In the international arena, as elsewhere, getting along well with one’s neighbours is a worthy goal. At the same time, we noted the early tension with respect to being perceived as too similar to the US, and the attempt to build a separate identity. Again, distinct identities may have been underscored when it came to the invasion of Iraq. Foreign policy has played a role in how it is that countries define their risks and, as we shall see, what they are willing to do about the risks faced and whether they are shared. 78 Australia’s position is again unique and draws heavily on acknowledging that the US, one of its "mates," has been threatened and therefore a duty is owed to help one’s mate protect and defend itself. Australia’s obligation is historical and based on the US having come to Australia’s aid during the Second World War. The attitude of Australia’s prime minister seems less one of leading the charge against terrorism than standing "shoulder to shoulder" with those who are mates and against those who might threaten that relationship between the two countries. At the same time that mateship comes to the fore, we note that the issue of terrorism provides an opportunity for the prime minister to attach the issue of immigration, a longstanding concern in Australia, to the issue of border protection against the more recent threat of terrorism. 79 We suggested that risk positions are both a result of perceived (and real) vulnerabilities, often intimately tied to the various forms of social, economic, and political capital that states bring to bear. It is true that specific political leaders may place selected emphases on certain threats, as well as selected interpretations of these threats over others. At the same time, because it is the office of the prime minister that is the focus here, the communications emanating from each prime minister’s office ensures appropriate messaging.95 We now turn to an examination of whether the talk that prevailed appears to have set the course for specific types of legislation and/or approaches to terrorism and security in each country. 80 In the aftermath of 9/11 there was much talk in these countries of the need for global controls, primarily as these related to the issue of border security and the ways in which countries might be able to prevent infiltration by terrorist groups. The border lockdown seemed to contradict the well-known fact that terrorist groups do not come exclusively from outside a country’s borders; in fact, the largest proportion of terrorist events against each of these countries are "domestic," or those that come from right- and left-wing political, religious, and environmental groups found within these states’ borders. Still, the desire to fortify the borders and demonstrate collective will to fight terrorism was strong. 81 In the discussion that follows, we focus on the major pieces of legislation that passed in each of the three countries that were written to address terrorist threat. "Knowingly collect or provide funds, either directly or indirectly, in order to carry out terrorist crimes. Knowingly participate in, contribute to or facilitate the activities of a terrorist group. Instruct anyone to carry out a terrorist act or an activity on behalf of a terrorist group (a "leadership" offence). The much-curtailed debate had focussed on the range of the measures contained within the act, such as providing the police with broad powers, including the arrest and detainment of individuals for up to 72 hours on suspicion of terrorist involvement without laying charges.97 Further, the act allowed for preventive arrest, at the same time it allowed for electronic surveillance, and for the designation of a group as a terrorist group. Finally, another controversial aspect of the act was the inclusion of the right of judges to compel witnesses to testify in secret about past associations or plans for pending acts, or risk going to jail for refusing to comply. and provisions dealing with recognizance with conditions, including preventive arrest to avert a potential terrorist attack. 87 The review, although recommending immediate changes to the act, was renewed without debate. Similarly, in 2004, the act was again renewed. In 2004, it was ruled that Part Four violated the Human Rights Act and that the state of emergency could be lifted. All of those held under the provisions of Part Four were released. 89 "Control orders" may be defined as tailored obligations that are placed on individuals identified as terrorist risks, including specifying where the individual can live, work, who he or she may speak with, travel to (or travel at all — passports may be confiscated), to name a few. The control orders have been highly criticized, primarily because they do not protect the individual against double jeopardy; even if the individual is able to appeal a decision, the Home Secretary may simply place another control order on the individual, starting the entire process over again. Over the past few years, there have been some adjustments to certain elements of the control order — for example, curfews for 12-14 hours are acceptable, but 18-hour curfews are considered a deprivation of liberty — and various judges have determined that the specifications of some control orders contravened the European Convention on Human Rights. The specifications of the control orders continue to be problematic. When the act was introduced in 2005, it contained a sunset clause suggesting review in one year’s time. The first review occurred in March 2006, approximately nine months after the London bombings, and has been renewed every year since. The Australian government has remained vigilant in its efforts to address terrorism. 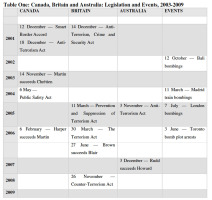 Many acts were passed between 2001 and 2004, most of which were amendments to strengthen and solidify the means by which existing acts could better address terrorism. For example, in 2002 acts were passed amending the Criminal Code: one amendment modernized treason offences, as well as creating offences that link to membership in terrorist organizations. Another example was an amendment to the Criminal Code making it an "offence to place bombs or other lethal devices in prescribed places with the intention of causing death or serious harm or causing extensive destruction which would cause major economic loss. "105 In 2002, the Crimes Act (1914) was amended to allow for the forensic identification of the victims of the Bali bombings. strengthening the counter-terrorism legal framework [including amendments to the Passports Act 1938, the Australian Intelligence Security Act 1979, and the Crimes Act 1914]. 94 Our review of the legislation created by Canada, Britain, and Australia provides us with further information regarding risk positions and how these may be reflected in the legislation that has followed the framing of terrorist threats by each of these countries. In the case of Canada, we note that the Anti-Terrorism Act supports prime ministerial talk which condemns activities associated with terrorism. The other major piece of legislation, the Smart Border Accord, was specifically created to protect and maintain the trade relationship between Canada and the US. The speed of the legislation put in place in Britain, not unlike Canada, along with immediate amendments to existing legislation by Australia, suggests swift condemnation of those involved in terrorist activities. Jason Glynos and David Howarth remind us, however, that it may be tempting to overplay the legislative actions of these countries as being somewhat unique, without taking into consideration a "wider net of social practices and logics." The wider net of social practices during the immediate post-9/11 era appeared to have been characterized by a "politics of fear." Public talk and legislative outcomes can both be seen as a means by which these countries demonstrated their positions as "team players" in the fight against terrorism, as well as helping to create and reinforce identities as being on the "right team" when it comes to terrorism. 95 The ways in which Canada, Britain, and Australia communicated the events of 11 September 2001 reveal a culmination of historic and current factors. While there were other significant terrorist events prior to that time, this event marks the largest foreign attack on US soil since Pearl Harbor. The risk positions of each of these countries were varied: Canada, situated next-door to the US, recognized the significant trade relationship with the US but also emphasized independence and free will. Britain and Australia, each literally oceans away from where the 9/11 attacks took place, took pains to ensure that they were seen by the US as "brothers in arms." Risk positions are complicated, involving history, proximity, perceptions of the future, and resources. Resources come in a variety of forms: from the foreign policies that countries maintain, to their physical and monetary amenities, to their histories with other international players. 96 Of particular note is the degree to which risk positions and actions undertaken in the name of fighting particular threats involve various forms of interaction. Canada’s approach to international relations, for example, is not created in a vacuum but rather is dependent not only on its own resources, but also on the weight of historical and present interactions with its neighbors and the world community. The close proximity to the US has resulted in a unique relationship both with the US and with other states globally. Nils Orvik suggests that Canada has practiced "defense against help" with the United States.108 This means that Canada has practiced some form of neutrality or non-alignment with others thereby defaulting to a position where the larger country sees the smaller country as no threat. We note the attention paid by Canada to appearing distinct from its immediate neighbor, but with the recognition that its relationship with the US is central to Canada’s economy — effectively limiting, to a great extent, how independent Canada can afford to be. As with the other countries, the history of relationships among foreign players has a large impact on their willingness to come together in the face of threat. At the same time, the issue of terrorism may also serve to unite seemingly unlikely partners against a common enemy. 97 The communications that we considered were delivered to both national and international audiences: our analysis did not distinguish among types of audiences. Of central importance, however, regardless of the audience to which these speeches were initially delivered, is that all communications are part of the public record and the public talk that Chowdhury and Krebs highlighted earlier.109 The position taken by the Australian prime minister as he addressed the local football association, for example, is part of the public record to which other countries have access and can assess for themselves how their global partners are presenting specific situations at any particular moment. The global accessibility of communications, along with historical relationships among countries, serves to create a dynamic in the twenty-first century that has never been seen before. Unlike events of any other century, at play in the present century is unparalleled access to data and, subsequently, influence. The ways in which politicians speak in public has never been more important — it becomes part of the public record in the time it takes to post something to the web, often seconds after delivery. The impact of such access plays into the concept of scale as mentioned by Sjoberg who notes, "according to political geographers, states, regions, and other scales do not exist a priori, but exist because of and dependent on human physical and social organization. "110 The specific impacts of physical and social organization and how these may be brought to bear on risk positions suggests that any one factor that we might consider, such as economic resources, must be considered in the context of other factors that might serve to balance or tip the scales of international relations in one particular direction or another. While we have considered three reasonably affluent countries in this analysis, the notion of "scaling risk position" might be effectively applied to countries that have less access to particular resources and how it is that they frame the threats they face. States that perceive of themselves as incurring dissimilar losses in the face of the same threat/issue are likely to define their responses to terrorism, for example, much differently as their physical and social organization will have a different historical evolution. Erin Gibbs Van Brunschot is Associate Professor in the Department of Sociology at the University of Calgary. Leslie W. Kennedy is a University Professor at the Rutgers University School of Criminal Justice and Director of the Rutgers Center on Public Security. 1 Sebastian Barnutz, "The EU's logic of security: politics through institutionalised discourses," European Security, vol. 19, no. 2, 2010, pp. 377-394. 2 Robert L. Ivie and Oscar Giner, "More Good, Less Evil: Contesting the Mythos of National Insecurity in the 2008 Presidential Primaries," Rhetoric & Public Affairs,vol. 12, no. 2, 2009, pp. 279-302. 3 Commonwealth of Nations description, found at: http://www.encyclopedia.com/topic/Commonwealth_of_Nations.aspx, last accessed 15 September 2011. 4 Mitchell Dean, "Risk, Calculable and Incalculable," in Lupton, D., ed., Risk and Socio-Cultural Theory (Cambridge: Cambridge University Press, 1999), p. 144. 5 Ulrich Beck, Risk Society (London: Sage, 1992). 6 Erin Gibbs Van Brunschot and Leslie W. Kennedy, Risk Balance and Security (Los Angeles: Sage Publications, 2007). 7 Laura Sjoberg, "Scaling IR Theory: Geography’s Contribution to Where IR Takes Place," International Studies Review, vol. 10, 2008, pp. 472–500. 12 http://www.dfait-maeci.gc.ca/foreign_policy/cnd-world/summary-en.asp, last accessed 31 January 2010. 13 Joel Sokolsky, "Realism Canadian Style: National Security Policy and the Chrétien Legacy," Policy Matters, vol. 5, no.2, 2004, pp. 1-44. 16 Tom Keating, "Multilateralism [and Canada’s foreign policy]: past imperfect, future conditional," Canadian Foreign Policy, vol. 16, no. 2, 2010, p. 10. 19 Tony Blair, "Speech at the George Bush Senior Presidential Library, Crawford, 2002," 7 April 2002, found at: http://www.britishpoliticalspeech.org/speech-archive.htm?speech=281, last accessed 31 January 2012. The term "panglossian" is a baseline form of optimism based on Voltaire’s character, Pangloss in Candide. 20 John Eatwell, "Britain and America: Ameliorating Unilateralism," Social Research, vol. 72, no. 4, 2005, p. 793. 21 Samuel Azubuike, "The ‘Poodle Theory’ and the Anglo-American ‘Special Relationship’," International Studies, vol. 42, no. 2, 2005, p. 130. 23 Due to a dispute in the early 1980s between the United States and New Zealand regarding visiting rights of US nuclear vessels in New Zealand waters, the ANZUS treaty demarcates a separate pact between Australia and New Zealand, with no relationship between the US and New Zealand. 24 http://www.kuro5hin.org/story/2004/10/5/75946/4089, last accessed 14 September 2011. 25 Gary Dean, "The Development of Australian Foreign Policy," 1999, found at: http://www.okusi.net/garydean/works/afp.html, last accessed September 14, 2011. 26 Daniel Lambach, "Security, Development and the Australian Security Discourse about Failed States," Australian Journal of Political Science,vol. 41, no. 3, 2006, p. 409. 27 David McGraw, "The Howard Government’s Foreign Policy: Really Realist?" Australian Journal of Political Science,vol. 43, no. 3, 2008, p. 472. 28 The data for Canada was collected earlier for a stand-alone paper and is now not available online except via the Library and Archives Canada. 29 David L. Altheide, Qualitative Media Analysis (Newbury Park, California: Sage, 1996). 30 Arjun Chowdury and Ronald R. Krebs, "Talking about Terror: Counterterrorist campaigns and the Logic of Representation," European Journal of International Relations, vol. 16, no. 1, 2010, p. 127. 31 Jean Chrétien, 11 September 2001, found at: http://www.cpac.ca/forms/index.asp?dsp=template&act=view3&template_id=1443&hl=e, last accessed 31 January 2012. 32 Jean Chrétien, 17 September 2001, found at: http://www.parl.gc.ca/HousePublications/Publication.aspx?Pub=Hansard&Mee=79&Language=E&Parl=37&Ses=1, last accessed 31 January 2012. 33 Jean Chrétien, "Address by Prime Minister Jean Chrétien on the Occasion of the APEC 2002 CEO Summit," found at http://epe.lac-bac.gc.ca/100/205/301/prime_minister-ef/jean_chretien/2003-12-08/stagingpm_3a8080/default.asp@language=e&page=newsroom&sub=speeches&doc=apecloscabos_20021026_e.htm, last accessed 7 February 2012. 34 Jean Chrétien, "Relevant Portion of CBC Interview Released," 12 September 2002, found at: http://epe.lacbac.gc.ca/100/205/301/prime_minister-ef/jean_chretien/2003-12-08/stagingpm_3a8080/default.asp@language=e&page=newsroom&sub=newsreleases&doc=cbc_interview.20020912_e.ht m, last accessed 31 January 2012. 35 Jean Chrétien, "Statement by Prime Minister Jean Chrétien in Support of a Motion in the House of Commons," 8 April 2003, found at: http://epe.lac-bac.gc.ca/100/205/301/prime_minister-ef/jean_chretien/2003-12-08/stagingpm_3a8080/default.asp@language=e&page=newsroom&sub=speeches&doc=statementoniraq.20030408_e.htm , last accessed 31 January 2012. 36 Jean Chrétien, "Address by Prime Minister Chrétien at the Fighting Terrorism for Humanity Conference," 22 September 2003, found at: http://epe.lac-bac.gc.ca/100/205/301/prime_minister-ef/jean_chretien/2003-12-08/stagingpm_3a8080/default.asp@language=e&page=newsroom&sub=speeches&doc=terrorism.conference.20030922_e .htm, last accessed 31 January 2012. 37 Jean Chrétien, 17 September 2001, found at: http://www.parl.gc.ca/HousePublications/Publication.aspx?Pub=Hansard&Mee=79&Language=E&Parl=37&Ses=1, last accessed 31 January 2012. 38 Jean Chrétien, "Statement by the Prime Minister," 2 December 2001, found at: http://epe.lacbac.gc.ca/100/205/301/prime_minister-ef/jean_chretien/2003-12-08/stagingpm_3a8080/default.asp@language=e&page=newsroom&sub=newsreleases&doc=israel.20011202_e.htm, last accessed 31 January 2012. 39 Jean Chrétien, "Address by Prime Minister Jean Chrétien to the EastWest Institute," 16 April 2002, found at: http://epe.lac-bac.gc.ca/100/205/301/prime_minister-ef/jean_chretien/2003-12-08/stagingpm_3a8080/default.asp@language=e&page=newsroom&sub=speeches&doc=eastwest.20020416_e.htm, last accessed 31 January 2012. 40 Jean Chrétien, "Address by Prime Minister Jean Chrétien to a Team Canada West Business Luncheon," 30 November 2001, found at: http://epe.lac-bac.gc.ca/100/205/301/prime_minister-ef/jean_chretien/2003-12-08/stagingpm_3a8080/default.asp@language=e&page=newsroom&sub=speeches&doc=tcwestla.20011130_e.htm, last accessed 31 January 2012. 41 Jean Chrétien, "Address by Prime Minister Jean Chrétien to a Team Canada West Business Luncheon," 28 November 2001, found at: http://epe.lac-bac.gc.ca/100/205/301/prime_minister-ef/jean_chretien/2003-12-08/stagingpm_3a8080/default.asp@language=e&page=newsroom&sub=speeches&doc=tcwest.20011128_e.htm, last accessed 31 January 2012. 42 Jean Chrétien, 17 September 2001, found at: http://www.parl.gc.ca/HousePublications/Publication.aspx?Pub=Hansard&Mee=79&Language=E&Parl=37&Ses=1, last accessed 31 January 2012. 43 Jean Chrétien, "Notes for an Address by Prime Minister Jean Chrétien at the Opening of the 58th Session of the United Nations General Assembly." 23 September 2003, found at: http://epe.lac-bac.gc.ca/100/205/301/prime_minister-ef/jean_chretien/2003-12-08/stagingpm_3a8080/default.asp@language=e&page=newsroom&sub=speeches&doc=ungaspeech.20030923_e.htm, last accessed 31 January 2012. 44 Jean Chrétien, "Notes for an Address by Prime Minister Jean Chrétien to the National Liberal Caucus," 19 August 2003, found at: http://epe.lac-bac.gc.ca/100/205/301/prime_minister-ef/jean_chretien/2003-12-08/stagingpm_3a8080/default.asp@language=e&page=newsroom&sub=speeches&doc=caucus-20030819_e.htm, last accessed 31 January 2012. 45 Tony Blair, "Statement to Parliament in response to terrorist attacks in the US," 14 September 2001, found at: http://webarchive.nationalarchives.gov.uk/20061004085342/number10.gov.uk/page1598, last accessed 31 January 2012. 46 Tony Blair, "Statement to Parliament in response to terrorist attacks in the US," 14 September 2001, found at: http://webarchive.nationalarchives.gov.uk/20061004085342/number10.gov.uk/page1598, last accessed 31 January 2012. 47 Tony Blair, "Statement to Parliament (US terror attacks)," 4 October 2001, found at: http://webarchive.nationalarchives.gov.uk/20061004085342/number10.gov.uk/page1606, last accessed 31 January 2012; and Tony Blair, "Statement on military action in Afghanistan," 7 October 2001, found at: http://webarchive.nationalarchives.gov.uk/20061004085342/number10.gov.uk/page1615, last accessed 31 January 2012. 48 Tony Blair, "Statement to Parliament in response to terrorist attacks in the US," 14 September 2001, found at: http://webarchive.nationalarchives.gov.uk/20061004085342/number10.gov.uk/page1598, last accessed 31 January 2012. 49 Tony Blair, "Statement to Parliament in response to terrorist attacks in the US," 14 September 2001, found at: http://webarchive.nationalarchives.gov.uk/20061004085342/number10.gov.uk/page1598, last accessed 31 January 2012. 50 Tony Blair, "Statement at 10 Downing Street," 25 September 2001, found at: http://webarchive.nationalarchives.gov.uk/20061004085342/number10.gov.uk/page1604, last accessed 31 January 2012. 51 Tony Blair, "Statement to Parliament (US terror attacks)," 4 October 2001, found at: http://webarchive.nationalarchives.gov.uk/20061004085342/number10.gov.uk/page1606, accessed 31 January 2012. 52 Since becoming prime minister, Blair focused on crime as a key priority of his government. His initiatives centered on: the causes of crime, zero tolerance, the links between drugs and crime, organized crime, reform of the criminal justice system, and policing reform. 53 Tony Blair, "Statement to Parliament in response to terrorist attacks in the US," 14 September 2001, found at: http://webarchive.nationalarchives.gov.uk/20061004085342/number10.gov.uk/page1598, accessed 31 January 2012. 54 Tony Blair, "Lord Mayor’s Banquet," 12 November 2001, found at: http://webarchive.nationalarchives.gov.uk/20061004085342/number10.gov.uk/page1661, accessed 31 January 2012. 55 Tony Blair, "Statement to Parliament in response to terrorist attacks in the US," 14 September 2001, found at: http://webarchive.nationalarchives.gov.uk/20061004085342/number10.gov.uk/page1598, accessed 31 January 2012. 56 Tony Blair, "Prime Minister’s statement to the House of Commons," 8 October 2001, found at: http://webarchive.nationalarchives.gov.uk/20061004085342/number10.gov.uk/page1621, accessed 31 January 2012. 57 Tony Blair, "Statement to Parliament in response to terrorist attacks in the US," 14 September 2001, found at: http://webarchive.nationalarchives.gov.uk/20061004085342/number10.gov.uk/page1598, accessed 31 January 2012. 58 Tony Blair, "Speech at the George Bush Senior Presidential Library," 7 April 2002, found at: http://webarchive.nationalarchives.gov.uk/20091006031459/number10.gov.uk/page1712, accessed 31 January 2012. 59 Tony Blair, "PM speech to Foreign Office Conference in London," 7 January 2003, found at: http://webarchive.nationalarchives.gov.uk/20060715135117/number10.gov.uk/page1765, accessed 31 January 2012. 60 Tony Blair, "Speech to the US Congress, Washington, DC 2003," 17 July 2003, found at: http://www.britishpoliticalspeech.org/speech-archive.htm?speech=285, accessed 31 January 2012. 61 Tony Blair, "Lord Mayor's Banquet", 12 November 2001, found at: http://web.archive.org/web/20030627140128/http://www.number10.gov.uk/output/Page1661.asp last accessed 6 February 2012. 62 Tony Blair, "’Britain’s Role in Europe’ — speech to the European Research Institute," 23 November 2001, found at: http://webarchive.nationalarchives.gov.uk/20061004085342/number10.gov.uk/page1673, accessed 31 January 2012. 63 Eatwell, "Britain and America." 64 Tony Blair, "A clear course for Europe," 28 November 2002, found at: http://webarchive.nationalarchives.gov.uk/20091006031459/number10.gov.uk/page1739, accessed 31 January 2012. 65 Tony Blair, "Saddam Hussein is a threat that has to be dealt with," 10 September 2002, found at: http://webarchive.nationalarchives.gov.uk/20091006031459/number10.gov.uk/page1725, accessed 31 January 2012. 66 Tony Blair, "Prime Minister’s Iraq statement to Parliament," 24 September 2002, found at: http://webarchive.nationalarchives.gov.uk/20091006031459/number10.gov.uk/page1727, accessed 31 January 2012. 67 Tony Blair, "PM’s Statement to Parliament on NATO Summit," 25 November 2002, found at: http://webarchive.nationalarchives.gov.uk/20091006031459/number10.gov.uk/page1737, accessed 31 January 2012. 68 Tony Blair, "Lord Mayor’s Banquet," 12 November 2001, found at: http://webarchive.nationalarchives.gov.uk/20061004085342/number10.gov.uk/page1661, accessed 31 January 2012. 69 Tony Blair, "PM statement on the G8 Summit," 1-3 June 2003, found at: http://webarchive.nationalarchives.gov.uk/20060715135117/number10.gov.uk/page3817, accessed 31 January 2012. 70 Tony Blair, "Speech to the US Congress, Washington, DC 2003," 17 July 2003, found at: ttp://www.britishpoliticalspeech.org/speech-archive.htm?speech=285, accessed 31 January 2012. 71 Tony Blair, "Lord Mayor’s Banquet," 12 November 2001, found at: http://webarchive.nationalarchives.gov.uk/20061004085342/number10.gov.uk/page1661, accessed 31 January 2012. 72 Tony Blair, "PM statement on G8 Summit," 1 July 2002, found at: http://webarchive.nationalarchives.gov.uk/20091006031459/number10.gov.uk/page1721, accessed 31 January 2012. 73 Tony Blair, "Saddam Hussein is a threat that has to be dealt with," 10 September 2002, found at: http://webarchive.nationalarchives.gov.uk/20091006031459/number10.gov.uk/page1725, accessed 31 January 2012. 74 Tony Blair, "Saddam Hussein is a threat that has to be dealt with," 10 September 2002, found at: http://webarchive.nationalarchives.gov.uk/20091006031459/number10.gov.uk/page1725, accessed 31 January 2012. 75 John Howard, "Transcript of the Prime Minister The Hon John Howard MP Address at Makin Electorate Event, Ingle Farm Sporting Club, South Australia," 15 October 2001, found at: http://web.archive.org/web/20040628103500/http://www.pm.gov.au/news/speeches/2001/speech1294.htm, accessed 31 January 2012. 76 John Howard, "Transcript of the Prime Minister The Hon John Howard MP Address to Petrie Community Function, Brisbane," 11 October 2001, found at:http://web.archive.org/web/20040628110702/http://www.pm.gov.au/news/speeches/2001/speech1290.htm, accessed 31 January 2012. 77 John Howard, "Transcript of the Prime Minister The Hon John Howard MP National Memorial Service Reflection," 24 October 2002, found at: http://web.archive.org/web/20040608052855/http://www.pm.gov.au/news/speeches/2002/speech1941.htm, accessed 31 January 2012. 78 John Howard, "Transcript of the Prime Minister The Hon John Howard MP Address to the Australian Defence Association," 25 October 2001, found at: http://web.archive.org/web/20040628110227/http://www.pm.gov.au/news/speeches/2001/speech1308.htm, accessed 31 January 2012. 79 John Howard, "Transcript of the Prime Minister The Hon John Howard MP Address to the Launch of Danna Vale’s Campaign," 7 October 2001, found at: http://web.archive.org/web/20040628103838/http://www.pm.gov.au/news/speeches/2001/speech1281.htm, accessed 31 January 2012. 80 John Howard, "Transcript of the Prime Minister The Hon John Howard MP at the Federal Liberal Party Campaign," 28 October 2001, found at: http://web.archive.org/web/20040628110400/http://www.pm.gov.au/news/speeches/2001/speech1311.htm, accessed 31 January 2012. 81 John Howard, "Transcript of the Prime Minister The Hon John Howard MP Address at the Launch of the Bennelong Campaign Office" 6 October 2001, found at: http://web.archive.org/web/20040628110638/http://www.pm.gov.au/news/speeches/2001/speech1275.htm, accessed 31 January 2012. 82 John Howard, "Transcript of the Prime Minister The Hon John Howard MP Superannuation and Savings Policy Launch," 5 November 2001, found at: http://web.archive.org/web/20040628105501/http://www.pm.gov.au/news/speeches/2001/speech1322.htm, accessed 31 January 2012. 83 John Howard, "Transcript of the Prime Minister The Hon John Howard MP at Multicultural Policy Announcement," 16 October 2001, found at: http://web.archive.org/web/20040628105809/http://www.pm.gov.au/news/speeches/2001/speech1295.htm, accessed 31 January 2012. 84 John Howard, "Transcript of the Prime Minister The Hon John Howard MP Address at the Launch of ‘A Stronger Tasmania Policy’," 2 November 2001, found at: http://web.archive.org/web/20040628103559/http://www.pm.gov.au/news/speeches/2001/speech1318.htm, accessed 31 January 2012. 85 John Howard, "Transcript of the Prime Minister The Hon John Howard MP National Press Club Address," 8 November 2001, found at: http://web.archive.org/web/20040628103314/http://www.pm.gov.au/news/speeches/2001/speech1324.htm, accessed 31 January 2012. 86 John Howard, "Transcript of the Prime Minister The Hon John Howard MP Address to the Parliament," 14 October 2002, found at: http://web.archive.org/web/20040608052303/http://www.pm.gov.au/news/speeches/2002/speech1913.htm, accessed 31 January 2012. 87 John Howard, "Transcript of the Prime Minister The Hon John Howard MP WA Division Launch," 24 October 2001, found at: http://web.archive.org/web/20040628110710/http://www.pm.gov.au/news/speeches/2001/speech1305.htm, accessed 31 January 2012. 88 John Howard, "Transcript of the Prime Minister The Hon John Howard MP Press Conference on Arrival in Dili, East Timor," 19 May 2002, found at: http://web.archive.org/web/20040629140107/http://www.pm.gov.au/news/speeches/2002/speech1654.htm, accessed 31 January 2012. 89 John Howard, "Transcript of the Prime Minister The Hon John Howard MP Press Conference on Arrival in Dili, East Timor," 23 November 2002, found at: http://web.archive.org/web/20040629140107/http://www.pm.gov.au/news/speeches/2002/speech1654.htm, accessed 31 January 2012. 90 John Howard, "Transcript of the Prime Minister The Hon John Howard MP Address to the 50th Anniversary of Coronation of Her Majesty Queen Elizabeth II Luncheon," 30 May 2003, found at: http://web.archive.org/web/20040621230935/http://www.pm.gov.au/news/speeches/speech99.html, accessed 31 January 2012. 91 John Howard, "Transcript of the Prime Minister The Hon John Howard MP Address to QLD Liberal Party State Convention," 7 September 2002, found at: http://web.archive.org/web/20040629140209/http://www.pm.gov.au/news/speeches/2002/speech1836.htm, accessed 31 January 2012. 92 John Howard, "Transcript of the Prime Minister The Hon John Howard MP Address to Victorian Division of the Liberal Party," 12 October 2002, found at: http://web.archive.org/web/20040629140111/http://www.pm.gov.au/news/speeches/2002/speech1896.htm, accessed 31 January 2012. 93 John Howard, "Transcript of the Prime Minister The Hon John Howard MP Address at the NSW Liberal Party State Council," 23 November 2002, found at: http://web.archive.org/web/20040629135842/http://www.pm.gov.au/news/speeches/2002/speech2001.htm, accessed 31 January 2012. 94 For parallels between the US and Britain, see: http://walt.foreignpolicy.com/posts/2009/07/13/ten_lessons_on_empire, accessed 14 September 2011. 95 At the same time, it is clear, and reasonable, that the speeches and press releases that were most temporally proximate to the event may have been the most emotive of the speeches under consideration. 96 http://www.cbc.ca/news/background/cdnsecurity/, accessed 14 September 2011. 97 http://www.cbc.ca/news/background/cdnsecurity/, accessed 14 September 2011. 98 http://www.justice.gc.ca/antiter/home-accueil-eng.asp, accessed 14 September 2011. 99 Lisa M. Seghetti. "Border Security: US-Canada Immigration Border Issues," CRS Report for Congress (CRS Web 2004). 100 Gary Doer and William Janklow, "Border Issues: A Report to Western Premiers and Western Governors," found at: http://www.scics.gc.ca/pdf/850086011_e.pdf, p. 3. 101 http://www.statewatch.org/news/2003/dec/atcsReport.pdf, accessed 16 September 2011. 102 http://www.statutelaw.gov.uk/content.aspx?LegType=S.I.+%28All+UK%29&Year=2006&searchEnacted=0&extentMatc hOnly=0&confersPower=0&blanketAmendment=0&sortAlpha=0&TYPE=QS&PageNumber=4&NavFrom=0&parentAct iveTextDocId=2484443&ActiveTextDocId=2484443&filesize=4146, accessed 16 September 2011. 103 http://www.guardian.co.uk/commentisfree/libertycentral/2009/jan/19/counter-terrorism-act, accessed 16 September 2011. 104 http://services.parliament.uk/bills/2007-08/counterterrorism.html, accessed 16 September 2011. 105 http://www.ag.gov.au/agd/www/nationalsecurity.nsf/AllDocs/826190776D49EA90CA256FAB001BA5EA?OpenDocume nt, accessed 16 September 2011. 106 http://www.ag.gov.au/agd/WWW/rwpattach.nsf/VAP/%285738DF09EBC4B7EAE52BF217B46ED3DA%29~Anti-Terrorism+Act+%28No2%29+2005.pdf/$file/Anti-Terrorism+Act+%28No2%29+2005.pdf , accessed 16 September 2011. 107 107 http://webdiary.com.au/cms/?q=node/950, accessed 16 September 2011. 108 Nils Ørvik, "Defence against help — a strategy for small states?" Survival, vol. 15, no. 3, 1973, pp. 228-231. 109 Arjun Chowdury and Ronald R. Krebs, "Talking about terror: Counterterrorist campaigns and the logic of representation," European Journal of International Relations, vol. 16, 2010, pp. 125-150. 110 Sjoberg, "Scaling IR Theory," p. 478.